Is the "Race to the Top" Rigged? President Obama is to be commended for making the improvement of the nation’s public school system a national priority and for challenging states and school systems to completely re-think the way they deliver education through the program called Race to the Top. States are being invited to submit proposals for funds to engage in a process of major educational reform. State plans must address six priorities that range from early childhood education to providing resources for high risk and special needs students to recruiting and training high quality teachers. However the recent announcement that Washington, DC superintendent Michelle Rhee fired 241 “low-performing” teachers after instituting her program called IMPACT. Rhee’s action raises the question if the emphasis on teacher performance indicates that the Race to the Top is rigged against the teachers. 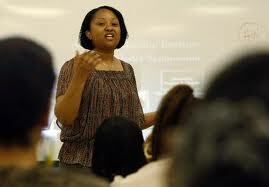 Whenever educational issues come up, the first target of critics is usually the teachers. So as the Washington Post reported, Rhee’s action is meant to “send a message” that teachers need to raise the quality of their performance. No doubt some teachers need to find another career, but others may be forced outto that career not because of lack of skill or commitment, but a lack of structure, resources and support. Critics often complain that teachers are overpaid for “only 9 months of work” and aren’t held accountable. Over the past several years no one group of people so valuable to our society have been so maligned and misunderstood as teachers. Now put those teachers in an old building that looks like a prison, has poor ventilation, with 35 kids per class, 5-6 periods a day, not enough textbooks, and no aides. Then include in that class 5-6 kids who come from dysfunctional families, another 5-6 who have childcare responsibilities or are expected to contribute to the family income, don’t give those kids breakfast and then blame those teachers that test scores are not “meeting standards”. You will begin to understand what Michelle Rhee’s “low-performing” teachers are up against. I offer three points of reference. First, my own children went through a suburban school system that was at best adequate. Every year the local paper published the salaries of all the teachers in the district, and complained about “rising property taxes,” which happened to be lowest in the county. Through their 13 years of schooling, my kids had some outstanding teachers, a few poor ones, and a majority of mediocre teachers. But these teachers had adequate technology, a decent library, and manageable class sizes. Most of the kids came from families that provided enough food and other necessities, so that the kids were not expected to contribute the family income. Most of those families had at least one college graduate, so that these kids grew up expecting to attend college. My kids and the vast majority of kids graduated on time and went to various post high school pursuits including college. Mediocre and even poor teachers get by in that system, because they were operating in a context that surrounded them with adequate resources, necessary support, and a college going culture. Second I am a college teacher who has taught graduate students, first and second year undergrads, and adults returning to earn a college degree. One year I simultaneously taught students across that spectrum. With the graduate students who were intelligent, motivated and resourceful, I was “outstanding” – my students grew and learned tremendously – by their own evaluation. However at the same time I taught a group of students most of whom were first generation college students, and who often had major economic and family responsibilities outside of class. I also taught some adult students who had difficulty reading and others who could not write coherent paragraphs. I worked doubly hard and pulled out every creative idea out of teaching bag of tricks. I ended up failing half the students in the undergrad class, even though it was one of the most creative, draining and challenging teaching experiences of my career. Even more amazing is that some of the students I failed actually thanked me for the way I had respected them in that class. So which teacher should be evaluated – the teacher of grad students, the teacher of the adult students or the teacher who failed half his undergrad class? Third, I am part of a community group that provides support to a large urban public high school, I sit on the board of an urban Mennonite high school and I have consulted with a new charter school. All three schools serve the same demographic of students: lower income, urban, mostly students of color. The urban high school sees only about 50% of its 9th graders persist to graduation. The Mennonite high school has a 100% college acceptance rate of students, and the charter school is only one year into operation, so it is too soon to tell. However, what is common to all three schools is that they all have innovative and creative principals and a group of teachers who love kids. However the charter school and Mennonite high school have class sizes around 20, while the public high school averages 30-35. The charter school and Mennonite high school have local autonomy, while the public high school answers to the superintendent. Despite its low test scores, the public high school has seen phenomenal improvement in scores and morale, was on track to substantially improve the graduation rate. Justlooking at the scores the superintendent decided the principal needed to be re-assigned and her efforts halted. My prediction is that any momentum and hope she built with students and teachers will be undercut and the school’s performance will decline. In these scenarios (my children’s school, my own classes, the three schools I compare) which teachers failed and who succeeded? Blaming teachers for a failed system is an easy explanation, but wholly inadequate. If I was teacher looking for a job, would I want to go into a system where the odds are stacked against me like the Philadelphia or DC school systems? Would I choose to operate in a system, where I am underpaid, and under-resourced, and yet expected to achieve progress on my kids test scores? Are the test scores even the proper measure of success? Or would I choose to go to an adequately resourced suburban district where even if I was mediocre, my kids would do okay? Or would I gravitate to a charter school or a private school, not subject to the whims of a politically vulnerable superintendent? If we as a nation are truly concerned about public education, we need to stop laying all the blame on the teachers. The system as a whole is broken and creating a culture of fear and distrust distracts everyone’s attention, especially the teachers, from being willing to re-shape and re-form that broken system. What we need is a systemic approach to urban education like Geoffrey Canada’s Harlem Children Zone. Canada recognizes that there many factors outside the school building that affect learning inside the school building. While I don’t fully agree with Canada’s almost totally behavioristic methods, I do think he has recognized that the problem with urban public education is systemic and is seeking to address it that way. This is why cities across the nation are seeking to adopt and adapt his model to their situations. I recently read the reflections of a 5th year teacher in the Philadelphia public school system. Half of all teachers quit by their fifth year, and this teacher had survived that threshold. Yet, just when she should be hitting her stride, she writes that one of the realities she lives with is that most days she drives home “feeling like a crappy teacher.” Moreover, as she looks out over the career ahead of her she wonders if she can sustain her career over a lifetime. I want that teacher to feel valued, supported, and excited about the work she will do, because those feelings will be conveyed to her students, and will influence her students’ performance. Creating a culture of fear and intimidation (as Michelle Rhee has done in DC) will not help this teacher feel any better about herself, her work or her students. She needs to be surrounded by a system that helps her get better at her craft, not that threatens her to get better or else. The Race to the Top seems rigged against the teachers, and the ones who will suffer in the end will again be the students. Thanks for your reflection. As a teacher in "one of those" Philly neighborhood high schools, it is wearing. Nevertheless, this is not just an urban/suburban dichotomy. Philly has many magnet high schools (and some middle). I've know very mediocre teachers in those schools who "get by" because the demographics of the magnet schools – especially schools like Masterman, Science Leadership Academy, Central, etc. – are very different from neighborhood high schools. They have parents many more "high powered" parents, including local politicians, connections, etc. Also, the teacher who completed 5 years, left a neighborhood high school after 4 years and is now at a selective magnet school. I don't blame her – she is a good teacher who I met during her first year – but staying at a neighborhood schools for the duration is taxing if the teacher tries to meet the needs to the students. This is compounded by the heavy handed bureaucracy of the School District. Now it is more complicated by the dictates of the Ackerman administration including highly scripted curricula.